We are all told that early diagnosis of cancer in adults saves lives – it is the same principle for children and young people. However, in order to gain an early diagnosis we must first be aware of the symptoms of cancer in children and teenagers. 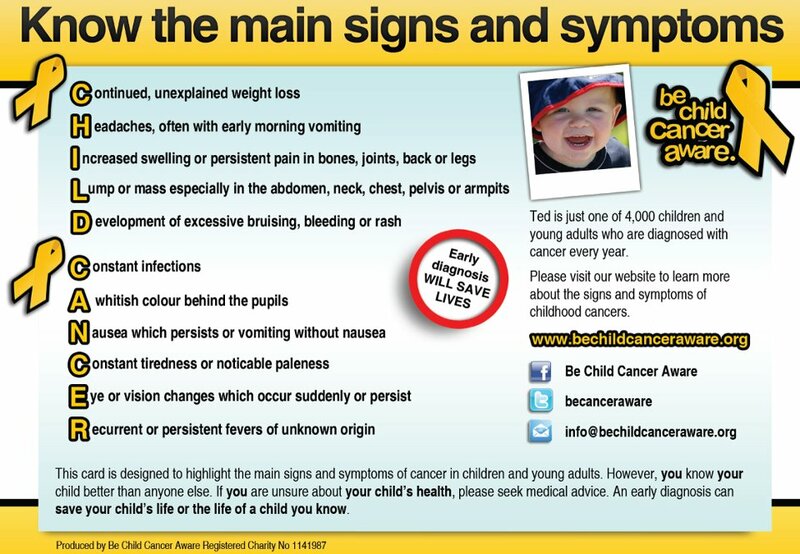 Our Child Cancer Information Pages provide details of the main signs and symptoms. Our schools programme will ensure that ALL PARENTS will be given information about the signs and symptoms of Childhood Cancer. 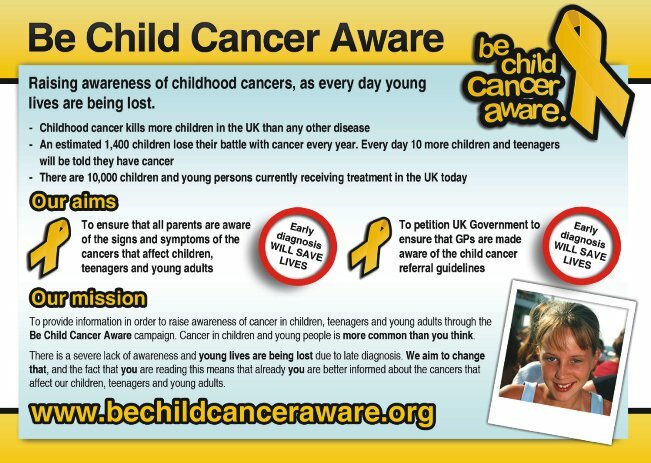 We have produced a signs and symptoms awareness card and the first delivery of 1,000,000 Awareness Cards to 5,000 schools is scheduled to take place week commencing 29th November, 2010. 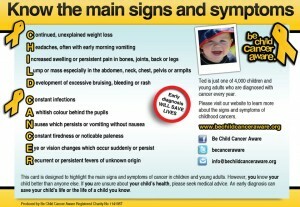 The awareness cards will be given to all parents of school age children detailing the signs and the symptoms. However, there is the unfortunate side of this programme which is cost and we will need to fund this programme through fundraising activities. There are 12,000,000 cards to be printed and delivered to 35,000 schools. In particular, GP’s need to be made more aware of the symptoms of various Cancers. We need to ensure that every GP follows the guidelines contained in the NICE Guidelines for Cancer referral. 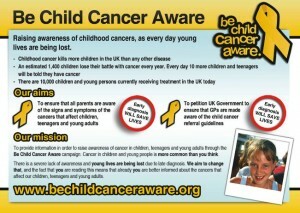 Child Cancer referral advice is viewable from Page 42 onwards. The symptoms of many Child & Teenage Cancers are very often dismissed as usual ailments. If a child or teenager’s symptoms continue with no satisfactory explanation then a referral must be made. The Gold Ribbon is the world-wide symbol for Childhood Cancer Awareness – We want the whole of the UK to recognise the Gold Ribbon in the same way that people recognise the Pink Ribbon. Please order yours today via the link on the right hand side.